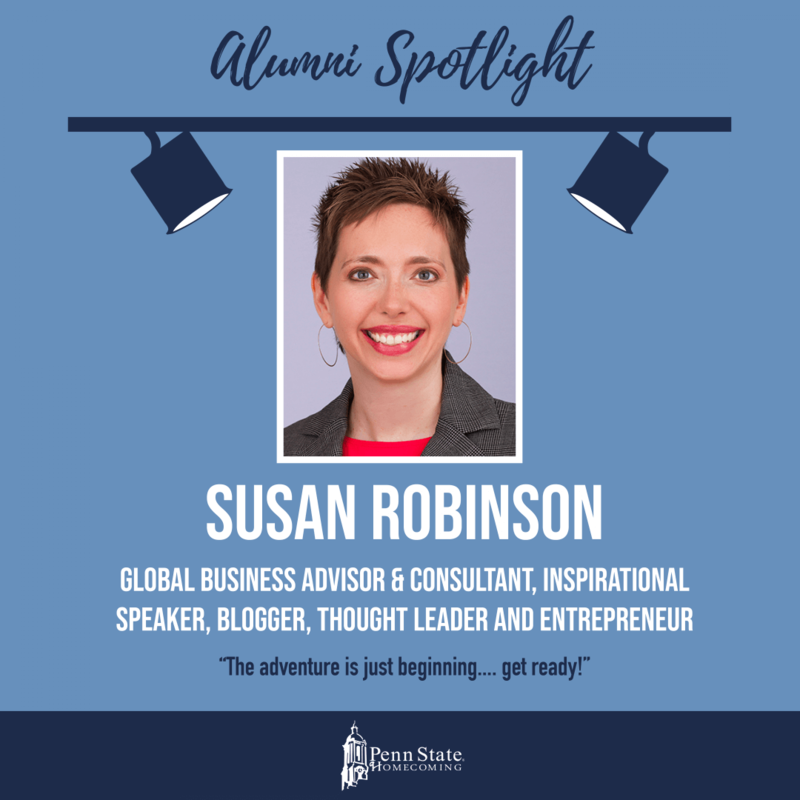 Susan Robinson is a 1994 Penn State graduate. She started off studying biology in hopes of becoming an orthopedic surgeon. “During my sophomore year, I was diagnosed with a genetic vision impairment, and [now I] am legally blind — so I changed [my] major to health policy and administration with minors in business and economics.” Following her time at Penn State, she received her MPA specializing in health policy and management at NYU. Prior to her current work, she had roles in government, non-profit and corporate sectors, most recently with senior and executive leadership positions. She currently wears many hats as a global business advisor & consultant, inspirational speaker, blogger, thought leader and entrepreneur. “In my advisory work, I partner with cross-industry CEOs, executive teams and high-performers on projects that impact relevance, revenue and reputation. This can include leadership development, strategy/operations planning, client-specific projects, etc. As a speaker, I give keynote speeches, commencement addresses and other kinds of talks that focus on talent, ability, performance and success. Each is tailored and includes a mix of experience, real-time events and humor,” says Robinson. She is fortunate enough to call each project she has worked on a highlight, some of which include: creating and giving her first TED Talk, which it seems to have reshaped thinking and perspective about ability on a global scale; helping an organization plan and realize seven times its revenue growth in one year because of the confidence it instilled in the leadership; leading a team to success because the work demonstrated how patient-centric work done in highly collaborative and strategic ways could increase cure rates, change perception and set new outcomes standards; managing an organizational turn-around, which helped her understand the systems and circumstances that promote and destroy businesses; installing electronic medical record systems in mobile medical units (prior to EHR systems being the norm in the healthcare industry) because the team was perfectly balanced and complementary in skill set, and it was innovative for the time. While she was at Penn State, she was a student health educator at the Student Health Center, and ultimately became one of the student directors. She was also involved with community work and volunteering. Many students can relate to the way she remembers her days in college. “I remember being late to nearly every class my senior year because I was always running into friends or other people I knew in between classes. When I recognized this, it felt great to know my own growth from freshman year when I was new and knew very few people and was early to classes. 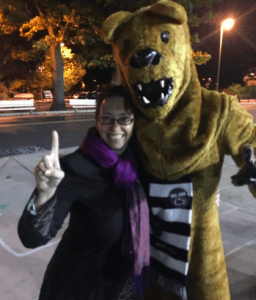 It was a unique way to measure my Penn State experience,” she says.